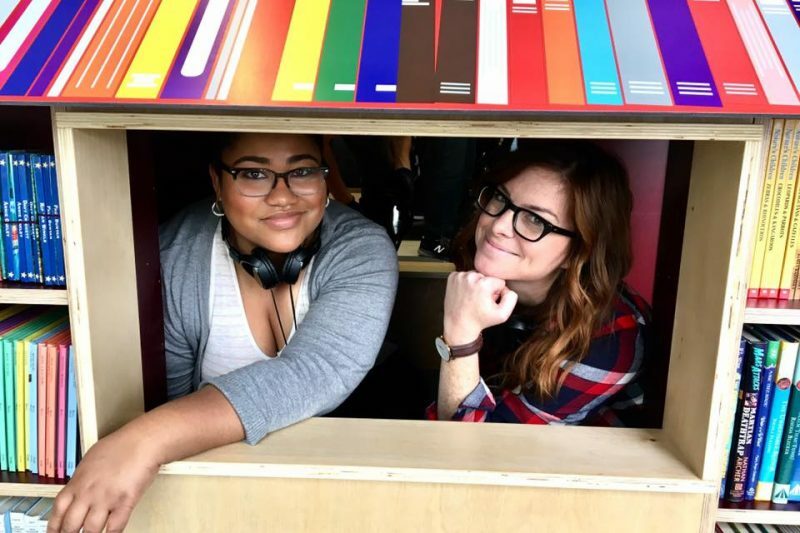 Marquita Robinson ’10 (left) on the set of “New Girl.” An episode she wrote aired Feb. 9. In the seven years since Marquita Robinson graduated from Washington and Lee University, she has had 11 jobs and internships. In most professions, that would indicate a problem, but for Robinson, it’s all a part of making it in show biz. Currently a staff writer for the Emmy-nominated FOX comedy show “New Girl,” Robinson thrives on the demands and uncertainty of working and living in Los Angeles. Sometimes, “the faucet turns off; even gifted people can hit a rough patch,” she said of the profession she chose. But for someone like Robinson, who organized the comedy skit group Wednesday Night Live at W&L, working on a comedy TV show or movie is a dream come true. “I knew when I was a freshman at W&L that I wanted to go to film school,” she said. After graduating with a double major in theater and journalism and mass communications, Robinson entered the prestigious film school at the University of Southern California. While some people skip this step and plunge right into interviews and auditions, Robinson wanted to take time to understand the business. With no contacts in Los Angeles, Robinson said film school gave her a chance to learn about how the business works, from contracts to the creative development side. Another advantage was that after graduation she had a built-in network of people who knew her and her capabilities and talents. She believes that in one year she has learned what it takes most to acquire through years of on-the-job experience. Robinson didn’t go directly from film school to a job with a television show or movie. She first worked for a talent-management company to further develop her connections in Los Angeles. There, she learned about managing writers, directors, show creators and others connected to the world she aspired to join. “It was a small company, but a good place to be,” she said. Her next stops included working as a writer’s assistant on the show “Lucky Seven,” until it was cancelled after six months. “I learned how a writers’ room operates,” she said of the experience. She later was a researcher for “@Midnight,” a live-comedy show that relied on trending topics on social media to create games. “I got to click on what you’re not supposed to click on at work,” she laughed. She worked for two feature writers on the movie “Barbershop 3” and was a show runner’s assistant for the ABC comedy “Black-ish.” Her connections scored her a writing spot on “Survivor’s Remorse,” a Starz show produced by LeBron James, about a professional basketball player who moves his family to Atlanta. On the “New Girl” staff, Robinson’s daily activities depend on what stage of development the script is in. She might be the keeper of the script or main writer, or she might be reading and helping to rewrite another writer’s script. “The writer has to find the balance between what’s really funny and what’s important for a character’s emotional arc,” she explained. The show follows the story of Jess, a quirky teacher, who moves in with three men after a bad break-up. There are brainstorming sessions, production meetings and table readings, where “we’re learning how the story and jokes work.” Some days are spent writing alone or rewriting with a group of writers. When the script is ready, Robinson can spend a week on set to produce her own episode and make any last-minute adjustments to the script. Because her father was in the Air Force, Robinson lived in many areas of the country and world, including upstate New York, where she was born, Okinawa and the Azores. Her father retired in Oklahoma City, where her immediate family now lives. She chose Washington and Lee based on an interview with an alumnus in Oklahoma City and “because it wasn’t in Oklahoma!” During the interview, she was especially impressed with the university’s Honor System. “My advisor, Bob de Maria [professor emeritus of journalism and mass communications] was my main cheerleader, and although I took some of his classes, it was time spent just talking to him in his office that had the most influence on me,” she noted. Owen Collins, professor of theater, and the rest of the Theater Department played influential roles and led her on the path to follow her passion. She wrote her theater honors thesis on directing and creative management. She also had internships in New York City, at Embassy Row and with the Food Network and celebrity chef Bobby Flay. While studying abroad in England with the theater department, she immersed herself in British television, which led to some teasing from her fellow travelers but added to her bank of knowledge when she arrived in Los Angeles. In addition to organizing Wednesday Night Live, Robinson worked as a resident assistant, was involved in numerous multicultural clubs and was president of the Ladies Club and the film society. She acted in shows, sang in the chorus and musicals and directed productions. Reflecting on her trajectory from W&L to the writers’ room of an Emmy-nominated TV show, Robinson says working for television is both her job and her hobby. She wants to keep working in the industry and dreams of creating her own show and characters who reflect people like herself and push the boundaries of the types of people represented on television.